Executive Summary - The Hess Visa Platinum Credit Card will appeal to those who use Hess stations frequently for their gasoline purchases. With this card, you get 3% rebate on any purchases at HESS, HESS EXPRESS and WILCO HESS stations. As an incentive, you will earn 10% rebates for the first 90 days. But there are some fine prints that you should be aware. Let's dig into this. 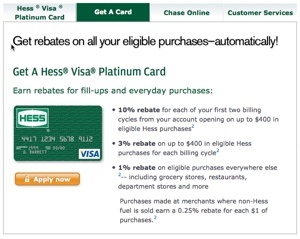 Rebate Formula - The HESSÂ® VisaÂ® Platinum Card from Chase offers a high 3% rebate on gas, merchandise and food purchases made at HESS, HESS EXPRESS and WILCO HESS stations. For the first 90 days, you can earn 10% rebate. In addition to gasoline, you also earn 5% rebate for merchandise and food purchases. You earn 1% rebate on all other purchases. Rebates are automatically credited towards your next HESS purchases. Rebates expire in 1 year though that should not be an issue with cardholders who frequent HESS regularly. You can also earn unlimited rebates. Caps On Rebates - The Fine Print - I told you earlier that there some fine prints. And it is regarding caps on the gas rebates that you earn. During the introductory period where you can earn 10% rebates on gas at Hess stations, you can only earn up to $40 in rebates for one billing cycle. That means you can only earn rebates for up to $400 in monthly gas spending at Hess. After the introductory period is over (where you earn 3%), you can only earn up to $12 a billing cycle (equals to $400 in monthly gas spend). There are no limits in the rebates you earn for other regular purchases. Fees - The Hess Visa Platinum has no annual fee. You get an introductory 0% apr on both purchases and balance transfers for either 3 or 6 months depending on your credit and relationship with Chase. The apr is either prime rate plus 5.99%, 9.99% or 14.99%. Other Benefits - You get standard platinum credit card benefits like travel insurance of up to $500,000, purchase assurance and extended warranty protection. Most gas station affiliated cards have moved from a percentage based cash back system to one in which consumers can earn rebates via a cents per gallon basis. So we cannot really compare them directly. In today's landscape, 3% is at the upper end of the range. If we use a few examples, the BP Visa lets you earn 15 cents per gallon. Marathon's card allows you to earn 25 cents per gallon if you spend $1,000 or more a month. Shell's MasterCard lets you save 20 cents per gallon when you spend more than $2,499 a month on the card. However, such comparisons are really quite meaningless because if you only used HESS, then it doesn't really matter what these other cards give you. A more relevant comparison would be between credit cards that pay cash back on gas spending at any stations. There are a few such cards that spring to mind. Hess Verus Costco Credit Card - The Costco credit card matches the Hess in terms of gas rebates (3%). But the advantage that the Costco card has over the Hess is that the 3% is applicable to all gas stations whereas Hess restricts you to Hess and Wilco stations. In addition Costco pays you 2% for dining and travel expenses, so that is an additional perk that the Hess Visa does not have. So overall, Costco comes out on top. Versus Amex Blue Cash EveryDay - The Blue Cash EveryDay pays a lesser rebate on gas than Hess (2% versus 3%). But unlike the Hess Visa, the card pays you 3% rebates on groceries and 2% on department stores as well. So while it pays less rebates on gas, the Blue Cash Everyday makes it up by giving better rebates on two other categories. Hess Visa - Is It Good? Whether the Hess Visa is good for you or not will depend on your circumstances and the reason that you are considering it. If you exclusively fill your gas at HESS stations, then this would be a very good card to get. You get a cash back percentage (3%) that is comparable and better in most cases compared to gas cash back cards. To earn even more cash back from you gas spending, you can even combine this card with a Discover it as it tends to include gas in their 5% category. For example, for Q3 2014, you can earn 5% cash back at gas stations with the card. In previous years, there have been two quarters where you can earn 5% cash back on gas. If you are looking at this card solely because your credit is not in the best of shape, then perhaps this card is not meant for you. You need a pretty decent good credit (700+) to have a higher chance of approval. If your credit is in the 600s, then perhaps you should consider the Barclaycard Rewards MasterCardÂ® - For Average Credit as it give you 2X points for gas, grocery and utility spending.